Here's a sneak preview of this month's Card Club projects using the Lovely As a Tree Stamp Set which is one of Stampin' Up! 's most popular stamps ever! I have had a request to demo a "reflection" technique so thought this stamp set would be perfect for that. I applied some Crystal Effects (101055) over the bottom of stamped image to create a glossy look and loved the result!!! 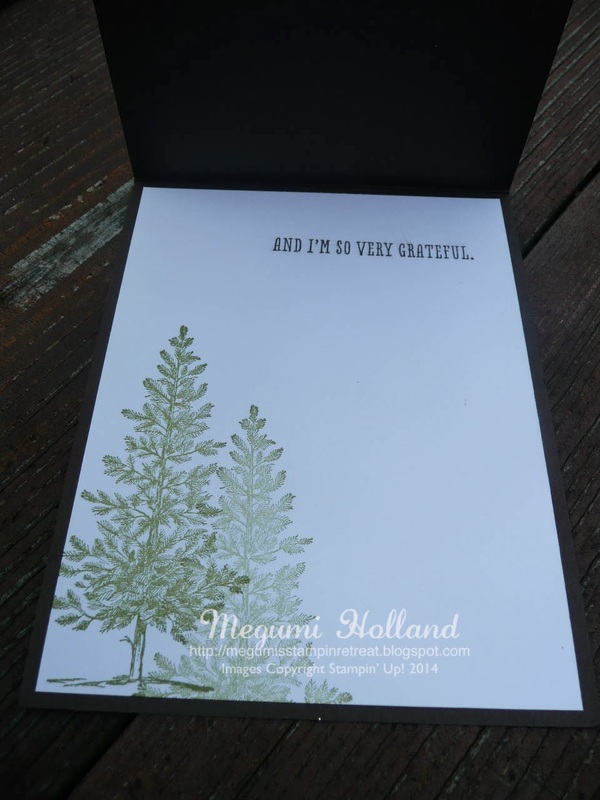 For the inside of my card, I also stamped a single tree image twice without re-inking. You can also do the same technique on your envelope to add some handmade touch! If you live nearby Sequim, Washington and would like to be part of my monthly Card Club, I have a great news for you. I am adding another Card Club starting this month. So check it out below for more details and please contact me (megumih4stamps@hotmail.com) if you are interested. I am so excited to announce my NEW Wednesday Night Card Club today. Currently I have three monthly Card Clubs and have had requests to have another Card Club. Starting next Wednesday, March 12th, my NEW Wednesday Night Card Club will meet on the second Wednesday of the month from 6:30 pm to 8:30 pm at my Stamping Studio. If you are interested, please contact me at megumih4stamps@hotmail.com. At my Card Clubs, we make at least two cards (sometimes we make a party favor in addition to two cards) and focus on learning new techniques/tricks. Each person places a minimum product order ($15 before shipping and tax) at Club workshop each month. Attendance is not required but you must turn in your order with your payment to me by your Club date. Each month we assign a hostess for the month and she will receive the hostess benefits for the Club workshop. Hostess benefits vary every month depending on the workshop total, but you are guaranteed to receive at least $25 in hostess dollars when you are the hostess of the month. Hostesses are in charge of some refreshments for the workshop. Please bring your basic tools and adhesive with you. 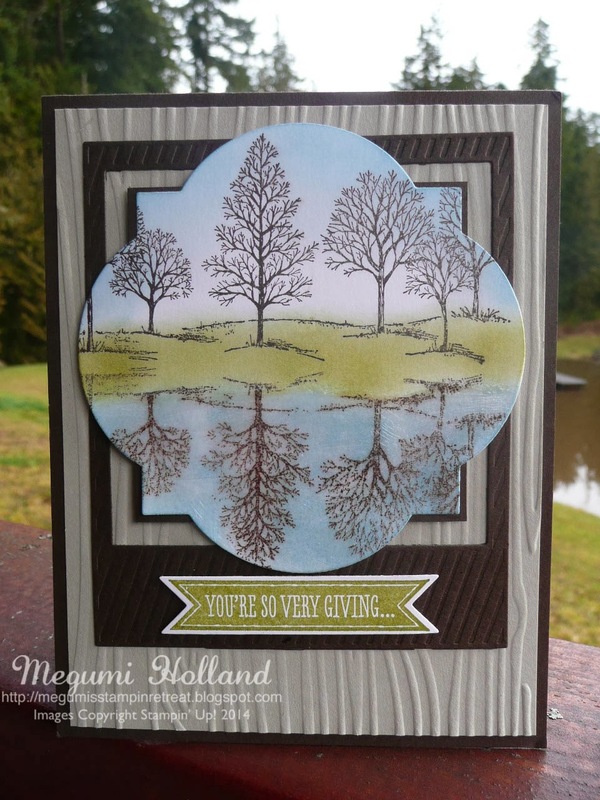 Click HERE to see my past Card Club Projects. Have FUN and make friends at the same time! Create awesome projects using my supplies and tools without any planning or prep-work! Learn new techniques and ideas! Looking for a monthly stamping retreat? Come and get inspired! A great way to build up your stamping supplies gradually. Receive a FREE Annual Book every year. Receive FREE merchandise when you are the hostess of the month! Receive special offers/incentives at my events! There are spaces available at some clubs. If you are not ready to commit to a monthly club, you are welcome to attend as a guest. Please contact me for availability. I also have Big Shot classes every month. Dates are not set every month but you can check it on my Web Site. Please contact me (megumih4stamps@hotmail.com) if you are interested or with any questions. I'm looking forward to hearing from you!! !